Dr. Kevin Foster, head of the Arizona Burn Center in Phoenix, was working on St. Patrick’s Day when the call came in. There had been a horrible accident. As a family in Phoenix was getting ready for a neighborhood party, the father built a fire in a fire pit in his driveway. He had used gasoline to ignite it and it exploded. He was burned badly and his 8-year-old daughter was engulfed in flames. In the moment Foster saw Isabella McCune for the first time, saw how badly she was hurt, he thought of his daughter, Katie, who is a few years older than Isabella and also has dark hair and eyes. He pushed the thought away and focused on the patient. Foster put Isabella in a drug-induced coma almost immediately. A tube down her throat helped her breathe. Third-degree burns covered her hands and arms, one side of her torso, her buttocks and legs, front and back. Her face was mostly spared. Over the next three days, Foster would take Isabella into the operating room several times, slicing open her limbs to relieve pressure from swelling, cutting away the destroyed skin. It was only the beginning. It would take months to repair the damage. Isabella would hurt all of the time, even with pain medication. She was burned over 65 percent of her body. She would need extensive skin grafts. Foster would use the unburned skin on her back, and he’d take more each time her back healed. Using her own skin meant there was less chance of rejection. It would be harrowing for Isabella. It would be hard on her family. It would haunt Foster. He focused on what he knew could be. Twenty years ago, Isabella would not have survived this. But Foster and his staff could fix her. The day would come when Isabella would leave the hospital. She’d go back to school and gymnastics. Foster would keep that picture in his mind. He’d try to make Isabella see it, too. 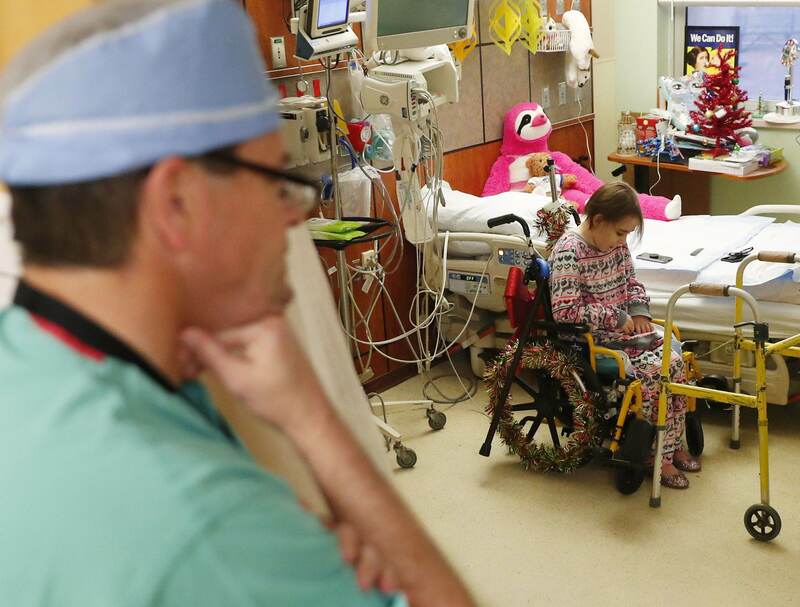 In the first six weeks, Isabella underwent 10 surgeries. Skin grafts covered her hands and arms and one leg. Her other leg and buttocks were still raw muscle protected by bandages. But Isabella worked hard in physical therapy, walking on legs thick with bandages, even through tears. Dr. Foster told her that the more she moved, the better she would heal. Foster was in charge of Isabella’s treatment. He knew it would be excruciating. “To make her better, I have to torture her,” Foster said. Yet Isabella lit up every time she saw the doctor, even when the news was bad. He didn’t always feel like he deserved her devotion. Foster might have left her in that medically-induced coma for longer — it is the best way to deal with the horrendous pain of an injury like this — but in her waking moments, Isabella had pointed at the intubation tube in her mouth and hooked her thumb to tell him to take it out. Afterward, when Foster put her under to clean her wounds and change her dressings, something that had to be done every other day, in the twilight of anesthesia, Isabella sang Taylor Swift songs. In the evening before a surgery, on May 23, Isabella was drowsy and pale, worn out from a dressing change that morning. She sat in a wheelchair, wrapped in a Super Girl blanket. She roused herself, eyelids flickering and then opening, when she heard her name and smiled. After the surgery, Foster told her she would be intubated, which she still hated, for five days, kept unconscious to stay still so she could heal. Foster hoped this might be her last surgery if he could get enough skin from her back to cover all the areas still exposed: most of her thighs and her backside. The other areas had healed nicely. Isabella McCune cries at the thought of intubation before her surgery at the Arizona Burn Center in Phoenix May 24, 2018. She was severely burned in a home accident in March. She had done this a half dozen times already. It didn’t get any easier. Her mother smoothed the hair near her face. “Are you hot?” Lilly asked. Isabella shook her head, no. Her tears dropped onto the blanket. She had been in the hospital for 68 days. She was sitting on raw muscle cushioned with padding and dressings. Her dad asked a nurse for more pain medication. Isabella hardly ever complained. She was not worried about the surgery. “Dr. Foster will be there,” she said. Foster was there in blue scrubs, his face covered by a mask. The operating room was warm, almost 100 degrees so Isabella wouldn’t get chilled. Without skin, burn victims have trouble regulating their body temperature. Isabella lay on the surgical table, covered in drapes, just her back and her bare feet showing. An anesthesiologist sat near her head. The team lined up on either side. 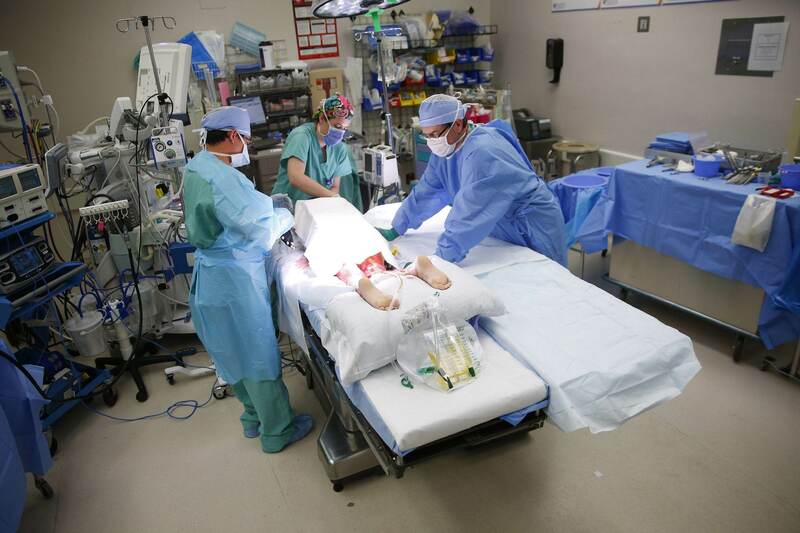 Dr. Kevin Foster (right) stands over Isabella McCune during surgery at the Arizona Burn Center in Phoenix May 24, 2018. She was severely burned in a home accident in March. Foster glanced at Isabella’s feet. The drapes help them focus on the task at hand. The team worked methodically, removing skin from Isabella’s back in strips, each a couple of inches wide and tissue-paper thin. 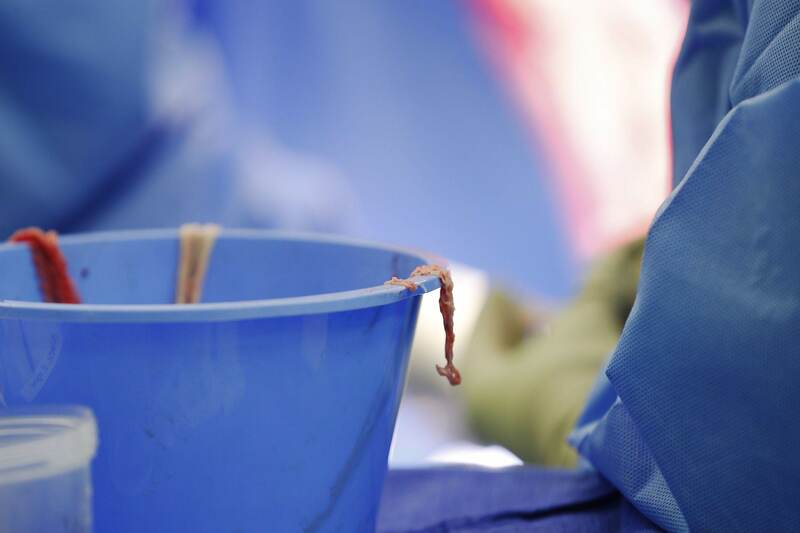 The skin grafts were handed down the table and draped over the edge of a bucket filled with saline solution to keep them moist. Foster sat at a small metal table at the end and ran the strips through a small machine that looked like a pasta maker; it punched holes in the strips, creating a mesh like a fish-net stocking. The skin grafts stretch to cover more surface this way. Foster took a small piece of skin to a side table where he mixed it with enzymes that separate the skin cells into a spray solution. He was using an experimental skin spray called ReCell with special permission from the U.S. Food and Drug Administration. Spraying it over the mesh grafts would help Isabella heal more quickly and with less scarring. Harvested skin from Isabella McCune’s back is ready for transplanting to her legs during surgery at the Arizona Burn Center in Phoenix May 24, 2018. She was severely burned in a home accident in March. Foster and another surgeon traded off, smoothing the grafts over the exposed areas and securing them to the tissue beneath with a staple gun, the sound sharp in the quiet operating room. “We are going to do her backside now,” Foster said. He carefully lifted first one leg and then the other. Staff murmured to one another as they worked. “We have enough, guys,” Foster said. All exposed areas were covered. Finally. It was 11:35 a.m. The surgery took four hours. Foster stood back, his arms crossed, watching as the grafts were covered with dressings and then bandages and splints. This was a tough surgery to go through once. Isabella had done it six or seven times. He followed Isabella back to her room. A nurse called her mother and handed Foster the phone. “Everything went great,” Foster told Lilly. Isabella had the giggles, though she wasn’t sure what was so funny. “I’m just so happy,” she said. It had been almost three weeks since her last surgery. Her back hurt still, from where skin was taken for grafts. But if it heals enough by Monday, she could have another surgery to patch a few holes. “I don’t think it will be ready,” Isabella said. It turned out that she was right. The surgery would be postponed. Isabella was ready to go home. Foster had told her maybe by the Fourth of July. 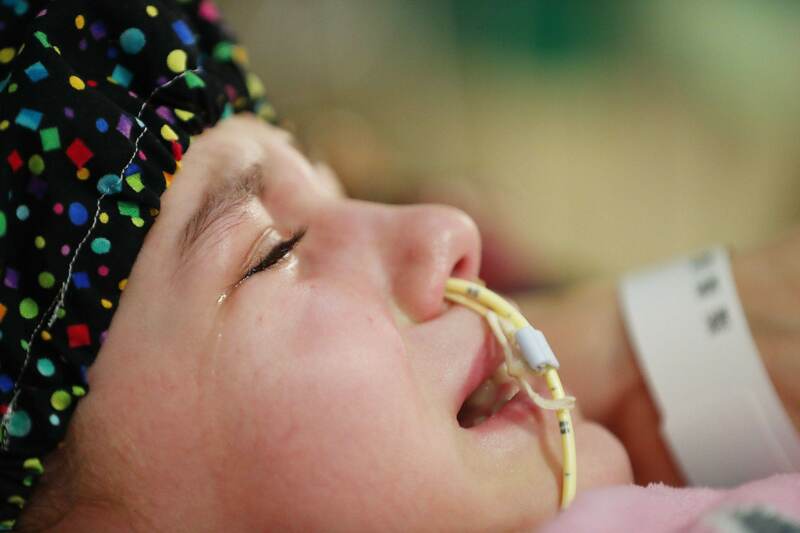 Isabella crinkled her nose and rubbed around the feeding tube that runs down her nostril. She ate a meatball sandwich from Red Devil Italian Restaurant earlier, but she still got about 80 percent of her calories through that tube. Isabella had told Foster earlier that day that she wants to be a burn nurse. “I’ve been through a lot, and I’ve had a hard time, so I know what it’s like,” she said. “I want to help people that have to go through what I’ve been through. I’ll be able to tell them not to be scared,” she said. A few weeks later, an infection caused Isabella to lose the new grafts, a heartbreaking setback. Foster moved Isabella into isolation on another floor. The infection resisted antibiotics. She was there through July, August and into September. 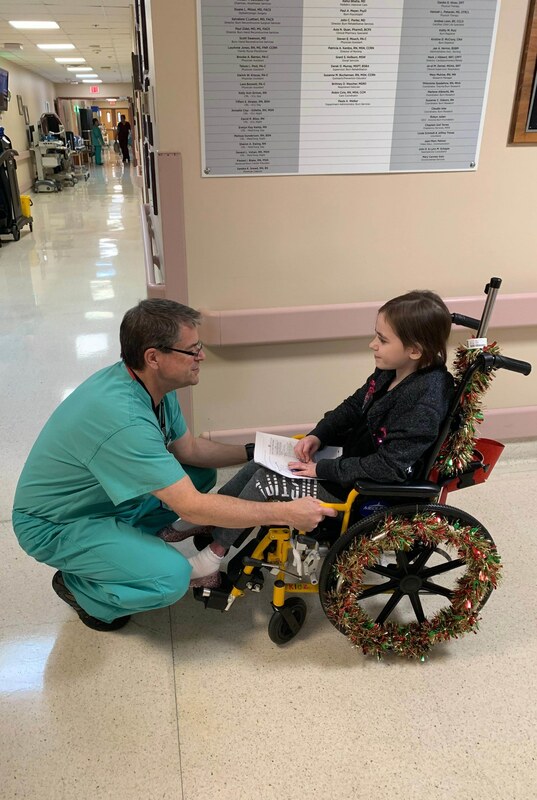 Dr. Kevin Foster talks with Isabella McCune in her room at the Arizona Burn Center in Phoenix Dec. 12, 2018. The 9-year-old was severely burned in a home accident in March. On Sept. 10, Foster was stoic as he told Isabella that he was going to put her into another medically-induced coma the next day, intubate her, and instead of cleaning her wounds and changing her dressings every other day, he would do it twice a day. Foster wanted the infection gone. She would miss her ninth birthday four days later. “It’s all right,” Isabella told him. She would do whatever he thought was best. “I’m like a daughter to him, so he does for me what he would do for his daughter,” Isabella said. Foster marveled that Isabella seemed to grasp what needed to be done. Adults often don’t take it as well. Isabella was glad the doctor was honest with her. “I would rather know what was going to happen,” she said. If Isabella didn’t understand something, she would ask for Foster. He’d come see her as soon as he finished rounds or got out of the operating room. “I knew I could believe him,” she said. Nurses promised to bring in cupcakes to celebrate Isabella’s birthday early. For Foster, it was the lowest time in her treatment. “This wasn’t just one step back,” he said. “It was a huge running leap backward.” He took it as hard as her family did. Isabella’s mother watched Foster as he left her room that day. Once he was out in the hallway, she saw his shoulders drop. In November, when Foster was called into the packed hospital auditorium and surprised with the 2018 MIHS Physician of the Year award, Isabella was there, sitting in a wheelchair, grinning at him. She had come to cheer him on. It was the first time he had seen her in regular clothes — not a hospital gown — over her bandages. Her hands had healed enough to clap for him. Hard. Foster felt like a hypocrite, accepting the award, because he hadn’t fixed her yet. The infection she had been fighting for months was gone. She was scheduled again for surgery to replace the grafts she lost. Isabella has been his most challenging case. Foster thought about her constantly, what he could do differently or better. When he took a vacation to Montana last summer, as his kids picked out souvenirs of the trip, Foster bought a stuffed fox for Isabella. “As much as I love having her here and taking care of her, I do want her to get better and get out of here,” he said. Isabella didn’t see it that way. She has adjusted to life in the hospital, getting stickers for doing well in physical therapy and surgery to earn prizes. A small speaker. An American Girl doll. She could wheel herself to the cafeteria for pizza. 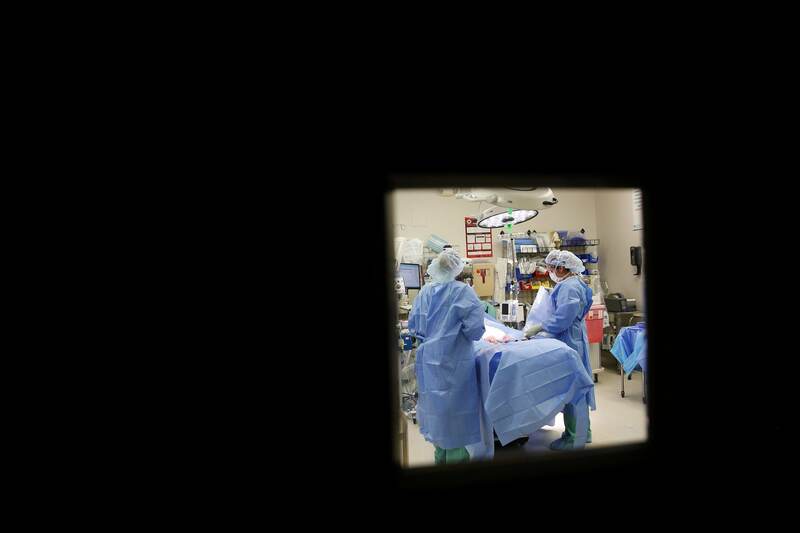 Isabella McCune undergoes skin-graft surgery at the Arizona Burn Center in Phoenix May 24, 2018. She was severely burned in a home accident in March. 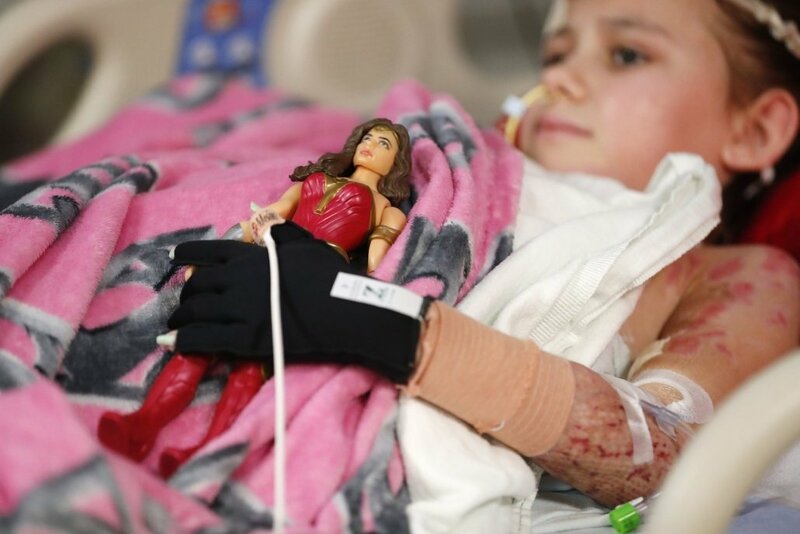 Isabella was back in surgery the Tuesday before Thanksgiving, but the skin grafts didn’t take. The buttocks are one of the most difficult areas to graft because the blood supply is not good, the tissue underneath fatty and the skin typically thin. It is difficult to keep the graft immobilized long enough for the blood vessels to attach properly. Three weeks later, Foster covered her rear end again and kept Isabella on her belly. This time, the grafts took. Over the next few days, he removed her feeding tube and bladder catheter. Her appetite was better. She was walking up and down the hallways with a walker and taking the stairs, one flight down and back up. Her pain was under control. After more than 109 surgeries and procedures, if nothing else went wrong, Foster thought, she might be able to go home before Christmas. On a Saturday evening, Isabella was surrounded by medical personnel, not because anything was wrong but because she was going out. Her parents and brother were attending the Arizona Burn Foundation’s annual holiday gala, but they didn’t know Isabella was coming. Her dad had just called to say he wished she could go. “My parents are going to freak out,” Isabella said happily. 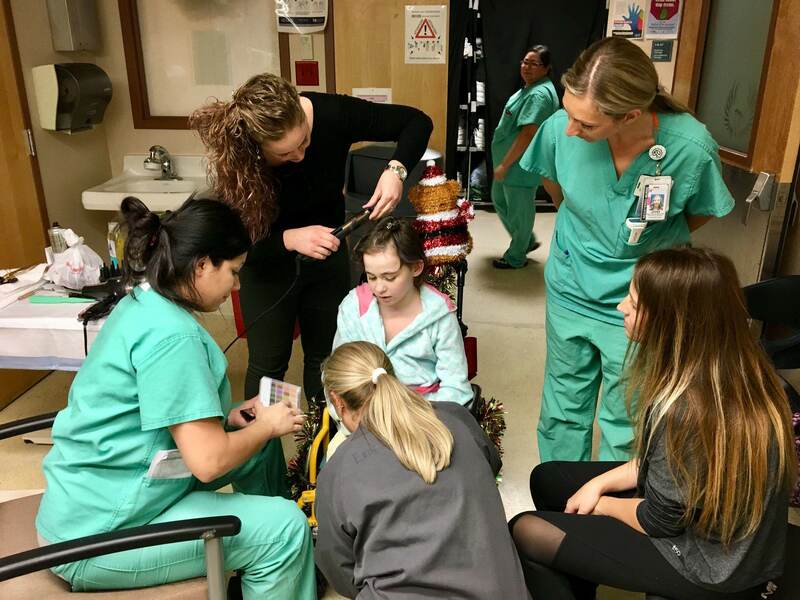 The staff at the Arizona Burn Center in Phoenix take time to help Isabella McCune get ready for her first night out of the hospital. Two days earlier, Foster had asked Isabella if she wanted to go to the gala. She knew he wasn’t kidding. “Dr. Foster doesn’t kid,” Isabella said. Transforming her for a night out turned out to be a community effort. Crystalynn Ramos, who was a licensed cosmetologist before she became a nurse, dabbed concealer under Isabella’s eyes. “Your cheeks are so rosy already,” Ramos said, “and look at these eyelashes.” They had been singed off when Isabella was burned, but they had grown back long and thick. Ramos applied mascara and shimmery gold eyeliner, tipping her lashes with it. “You are going to sparkle,” Ramos said. Her dress, hanging on the cabinet door, sparkled, too, ivory with lace, flowers and a tulle skirt. Physician resident Emily Helmick covers Isabella McCune’s the PICC line, a catheter tube in her right arm, with a ribbon, stitching it closed with a suture needle. “You know how to sew?” Isabella asked. “Skin,” Helmick said, making Isabella giggle. “Isn’t it beautiful?” Isabella asked. She didn’t mind that it would show her scars. She was proud of them. They showed what she’d been through, how strong she was. Nurse Brook Chavarria finished her shift and then came back in to do Isabella’s hair, bringing her dress and heels for the gala. Isabella looked sideways at the flat iron Chavarria used to curl her hair. The heat coming off it made her nervous. “I won’t burn you, I promise,” Chavarria said carefully releasing a ringlet. She had been on duty when Isabella first arrived in the emergency department. Burn technician Erin O’Neill painted Isabella’s fingernails a shimmery rose gold. Emily Helmick, a physician resident, had bought Isabella a pair of glittery purple flats and a matching purple clutch. Ramos clipped diamond clips into her hair like a crown. 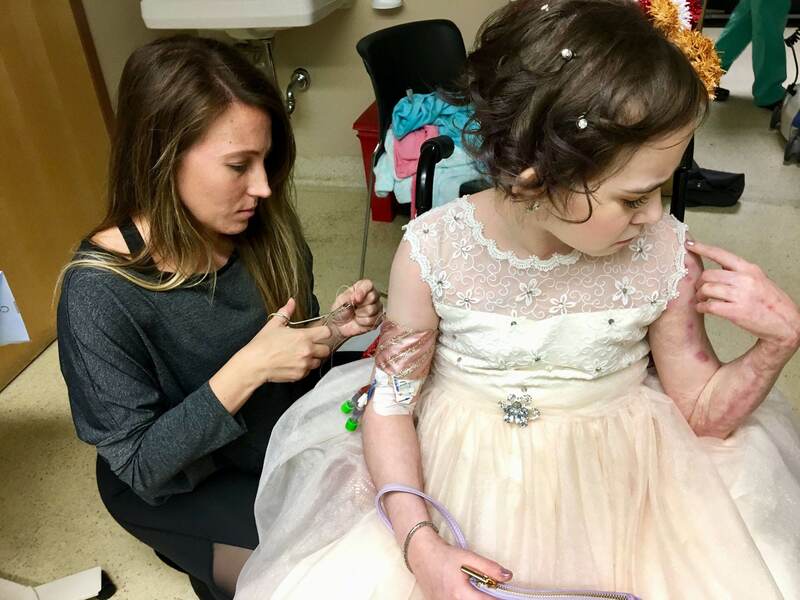 Isabella carefully stood holding onto the back of her wheelchair while the bandage on her back was changed, the area still raw from where Foster had taken skin grafts for her last surgery. Firefighters Kevin Duzy and Rich Lara escorte Isabella McCune to the Arizona Burn Foundation’s gala on Dec. 8, 2018. It was the first time Isabella had left the hospital in 268 days. Then, with O’Neill on one side and Helmick on the other, Isabella stepped into her dress. O’Neill tied the bow on the back. Isabella turned from side to side, making the skirt swish, smiling. “The shoes,” Isabella remembered. Helmick squatted down and gently guided her feet into the glittery flats. They fit perfectly. Like Cinderella. Nurse Dana Rogoveanu gave Isabella an oral dose of pain medication. It should last the evening. Isabella eased herself back into her wheelchair and fluffed out her skirt. Her escorts were three firefighters who have volunteered to take Isabella in an ambulance. The gurney was draped with silver tinsel. “We don’t get to take a princess out very often,” Kevin Duzy said. “We’ll have her home by midnight,” Lara promised. It was the first time Isabella had left the hospital in 268 days. Four days later, Isabella was still wearing the glittery purple flats with her pajamas. The gala was fun, she said. Her parents were surprised to see her there. “My dad lost it,” she said, grinning. Someone at the gala donated $1,500 to pay for Isabella to go to burn camp next summer. Mark Dewane, head of the board that over sees the burn center as part of the Maricopa Integrated Health System, told Isabella her nursing school tuition would be paid if that’s what she decides to do. 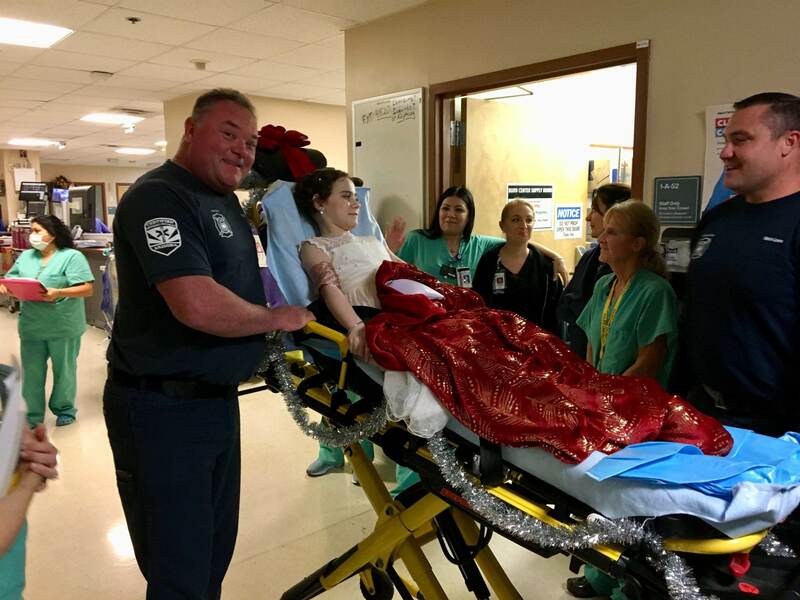 Dr. Kevin Foster, head of the Arizona Burn Center in Phoenix, says goodbye to 9-year-old Isabella McCune as she leaves after nine months in his care. The doctor pushed her wheelchair out to her parents’ car. Later that day, the doctor came in to tell Isabella that she would go home on Monday, nine months to the day she was admitted. She knew he wasn’t kidding. “Dr. Foster is kind of a serious guy because he has a serious job,” Isabella said. Now the doctor leaned into Room 9 and noticed Isabella’s shoes. “If I had a pair of shoes like that, I’d wear them every day, too,” Foster said. She told him that she had done her dressing change that morning with no intravenous pain medication, just 5 milligrams of oxycodone. Isabella asked if she’d have to be sedated to remove the PICC line from her arm. “How will you guys take it out?” she asked. Isabella has a list of people she is going to miss when she leaves. She told Foster she would miss him the most. “You’re going to forget about me the minute you walk out of here — and that’s the way it should be,” the doctor told her. PHOENIX, Sept. 18, 2018 /PRNewswire.com/ — Phoenix’s health care landscape is about to change dramatically — as is one of Phoenix’s most iconic properties. Phase one of the project includes a new building totaling 200,000 square feet and eventually will house nearly 800 Creighton health sciences students in Arizona. The expansion will include a four-year medical school, nursing school, occupational and physical therapy schools, pharmacy school, physician assistant school and emergency medical services program. A second building adjacent to the first may be added in the future. The new building will be located along Central Avenue on the Park Central property, on land that is currently a parking lot. Construction on the new building will begin in spring 2019, the first on the Park Central site in decades, and is expected to be completed in spring 2021. In the interim, Creighton University’s College of Nursing, which launched its first Phoenix-based Accelerated Bachelor of Science in Nursing program in January, will move into a temporary home at Park Central effective January 2019. The School of Medicine, which first came to Phoenix in 2009, will continue operating its third- and fourth-year programs out of space adjacent to Dignity Heath St. Joseph’s Hospital and Medical Center until construction is completed in Spring 2021. The new Phoenix campus for Creighton will meet the University’s current needs while providing ample room for expansion in the future, and the central Phoenix location makes it convenient for students doing their residencies and other studies at nearby hospitals. Creighton University’s presence in Phoenix is expanding to help meet the growing demand for health care professionals in the coming years. In June 2018, the Creighton University School of Medicine assumed sponsorship of physician graduate medical education training programs at Dignity Health St. Joseph’s Hospital and Medical Center and Maricopa Integrated Health System (MIHS), in conjunction with District Medical Group (DMG), encompassing 11 programs with 325 residents and fellows. Additionally, the four partners have formed the Creighton University-Arizona Health Education Alliance, which was officially launched on Sept. 1, 2017. It is designed to improve and expand current health education programs offered by each of the entities. The Alliance will also develop new academic and clinical education programs in medicine, nursing, pharmacy and allied health. The Alliance’s activities will also be based out of the new Park Central facility. Governor Doug Ducey, who officially recognized Creighton University’s contributions to the State of Arizona with a proclamation, hailed the Creighton expansion as a significant addition to the state’s health care infrastructure. The new Creighton University facility is also a significant boost for the revitalization of Park Central. Sharon Harper, president & CEO of Plaza Companies — which is redeveloping Park Central in partnership with Holualoa Companies — said Creighton is an ideal fit for the project. Phoenix Mayor Thelda Williams welcomed Creighton’s expansion in Phoenix as a dramatic step to strengthen the region’s growing bioscience industry. For more than a decade, Creighton University has been an academic mainstay in Phoenix, sending medical students to St. Joseph’s Hospital and Medical Center for rotations. That relationship expanded significantly in 2009 when the University and St. Joseph’s established a Creighton campus for third- and fourth-year medical students at the Phoenixhospital. The St. Joseph’s campus is home to approximately 100 Creighton medical students. Sydney J. Vail, MD, FACS, has been named Chairman, Department of Surgery, at Maricopa Integrated Health System, Maricopa County’s safety net system of care and public teaching hospital. In this role, Dr. Vail will oversee all functions of MIHS’s Department of Surgery, which is comprised of 16 divisions that include: general surgery (including minimally invasive and robotic-assisted surgery), trauma, burn, hand, neurological, otorhinolaryngology, pediatric, plastic, thoracic, surgical critical care, urology, breast surgical oncology, podiatry, physical medicine & rehabilitation, ophthalmology and vascular surgery. Dr. Vail has been chief of MIHS’s Trauma Center since 2015, and has led a statewide “Stop the Bleed” campaign that has trained over 3000 Arizona residents, ranging from teachers to public defenders, on how to take action in a bleeding emergency before EMS arrives. MIHS has the only trauma center in Arizona verified by the American College of Surgeons to treat both adult and pediatric trauma patients, keeping families together in their hour of need. Dr. Vail is also a deploying team member of the Arizona Department of Public Safety’s SWAT Team; EMS Program Director, U.S. Border Patrol, Tucson and Yuma sectors; EMS Medical Director, Arizona Department of Health Services; and Senior Medical Instructor, International School of Tactical Medicine. Dr. Vail was the trauma director at Carilion Roanoke Memorial Hospital during the 2007 Virginia Tech shooting, one of the deadliest mass shootings in U.S. history. After receiving his undergraduate degree from George Washington University in Washington, D.C., Dr. Vail earned his MD from the Georgetown University School of Medicine in 1989. His clinical training includes internship and residency at Albert Einstein Medical Center in Philadelphia; and fellowships in Trauma & Emergency Surgery and surgical and trauma critical care at the University of Miami, Jackson Memorial Hospital, in Florida. Dr. Vail is also chairman of the Disaster Preparedness Committee, Trauma Center Association of America and a member of the Phoenix Sky Harbor Emergency Preparedness Committee. 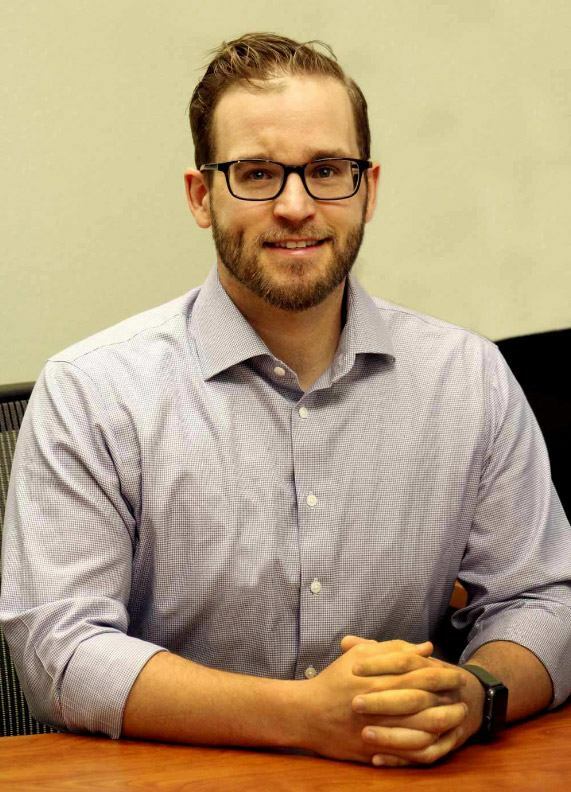 He has been honored twice in the Phoenix Business Journal’s “Health Care Heroes” awards, and received the Golden Scalpel Award for excellence in teaching by the Department of Surgery Residency Program, Maricopa Medical Center. 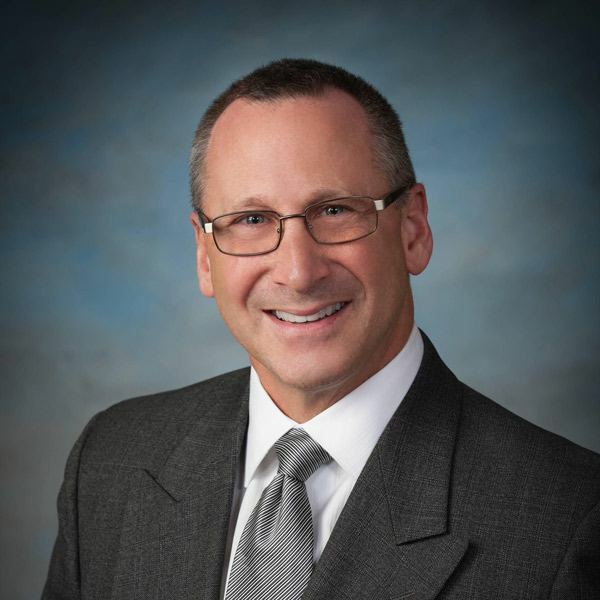 Dr. Vail is a diplomate of the American Board of Surgery in Surgery and Surgical Critical Care, and a Fellow of the Advisory Board Company, in Executive Leadership. About Maricopa Integrated Health System (MIHS) Located in Phoenix, Arizona, Maricopa Integrated Health System has a proud tradition of being both the community safety net health care system, with a mission and commitment to serving the underserved and Arizona’s only public teaching hospital. MIHS consists of Maricopa Medical, the only Level I Trauma Center in Arizona verified by the American College of Surgeons to care for both adults and children, Arizona’s only nationally verified Burn Center serving the entire Southwestern United States, MIHS’s McDowell Healthcare Center, which is the largest provider of HIV primary care in Arizona, the Refugee Women’s Health Clinic, the Arizona Children’s Center, two behavioral health centers, and 13 neighborhood Family Health Centers. To learn more about MIHS, please visit www.mihs.org. We are excited to welcome Denise Atwood to the Risk Management team as DMG’s new CRO. Three DMG providers are finalists for the Phoenix Business Journal’s 2018 Health Care Hero Awards. They received a tremendous amount of submissions, so we are very proud! The Phoenix Business Journal along with Abrazo Health Care, present these awards which recognize the outstanding contributions made in our community. A panel of judges reviews the nominations and selects the finalists from each category. All finalists will be recognized and the winners will be announced at an awards breakfast on Thursday, August 23, at the Hyatt Regency at Gainey Ranch from 7am – 10am. The finalists and winner for each category will also be featured in the Health Care Heroes special section to be included in the edition of the Business Journal. Jacqueline A. Chadwick, M.D., has assumed the position of founding executive director of the Creighton University-Arizona Health Education Alliance. The Alliance seeks to expand and improve health care education and training opportunities for medical students throughout the state. Make-A-Wish Arizona, the local chapter of the international wish-granting organization, and District Medical Group(DMG), a Phoenix-based non-profit medical group comprised of more than 650 providers across medical specialties, are piloting a unique referral process to increase life-changing wish opportunities for eligible children receiving care at Arizona’s Children’s Rehabilitative Services (CRS), Phoenix. PHOENIX (July 9, 2018) —Elizabeth Ferguson, MD, a highly regarded surgeon and educator at Maricopa Integrated Health System, has been named Designated Institutional Official (DIO) of the Creighton University–Arizona Health Education Alliance. Ask a Doc: Do your kids need sunscreen if they’re in the shade? Question: Do you need to wear sunscreen if you’re outside in the shade? You may think you’ve got it made in the shade, but you can still be hit by harmful UV rays that bounce off the sand, sidewalk, pool or ocean. They can even bounce off grass! Even under an umbrella or a shade structure, UV rays can slink through the fabric and cause skin damage. Yes, shade is a blessing. But if you’re relying on it to protect your skin from sunburn, you may be very disappointed. That’s why you’ll want to apply sunscreen before you step outside, even if you’ll stay in the shade. Use sunscreen of at least SPF 50 or higher, with full UV spectrum. Find a brand that you like – you’ll be more likely to use it. Reapply sunscreen every two hours you’re outside. Wear wide-brimmed hats (at least 3 inches of brim all around the head) and UV protective clothing. Avoiding the sun during peak hours is essential. From around 10 a.m. to 2 p.m., try not to go outside. Or, stick to shaded areas such as swimming at times when the pool is out of the direct sun. Get in the habit of applying sunscreen. Daily application of sunscreen in the morning, regardless of your activities during the day (even just driving in the car), can yield healthier and happier skin. Follow these rules and your skin will thank you. 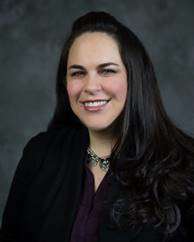 Mansi Sarihan, MD, is chief of dermatology at Maricopa Integrated Health System and Clinical Assistant Professor, University of Arizona, College of Medicine-Phoenix. https://www.dmgaz.org/wp-content/uploads/2018/07/suncreen-application.jpg 425 1080 District Medical Group https://www.dmgaz.org/wp-content/uploads/2018/12/phoenix-medical-group.png District Medical Group2018-07-05 09:49:532018-08-24 08:48:40Ask a Doc: Do your kids need sunscreen if they're in the shade? An alliance between some of the most respected names in healthcare in Arizona will become one of the largest providers of graduate medical education and physician training in the state. The Creighton University-Arizona Health Education Alliance will now oversee the Graduate Medical Education (GME) programs for two of the Valley’s largest healthcare institutions — Maricopa Integrated Health System and Dignity Health St. Joseph’s Hospital and Medical Center, as well as the program for District Medical Group. The consolidation, which was effective June 1, will mean that 325 GME residents will be under the Alliance’s umbrella. The move will make the Alliance the second largest provider of Graduate Medical Education programs in the state of Arizona behind the University of Arizona, which is the only state school with GME programming. Neuroscience residents and fellows will remain under St. Joseph’s sponsorship. The transition is part of the formation of the Creighton University Arizona Health Education Alliance, an initiative formed last fall between Creighton, MIHS, Dignity Health and District Medical Group aimed at increasing the number of doctors and other health professionals in Arizona. The formation of the Alliance and the sponsorship of the GME programs represents an expansion of Creighton’s impact on the Arizona medical community. The Jesuit, Catholic university has had a presence in Arizona for over a decade. More than 250 Creighton-trained doctors are currently practicing in Arizona, and the St. Joseph’s campus alone is currently home to more than 100 Creighton medical and nursing students. Patty White, President & CEO of Dignity Health St. Joseph’s Hospital and Medical Center, said the partnership grew from a successful decade-long track record between Dignity Health and Creighton. Arizona currently ranks 32nd in the nation for the number of active physicians per 100,000 population. The Creighton University-Arizona Health Education Alliance, which was officially launched on Sept. 1, 2017, is designed to improve and expand current health education programs offered by each of the entities. The alliance will also develop new academic and clinical education programs in medicine, nursing, pharmacy, and allied health. Steve Purves, president and CEO of Maricopa Integrated Health System underscored that the Creighton University-Arizona Health Education Alliance will expand current health education programs offered by each of the entities and will also develop new academic and clinical education programs in medicine, nursing, pharmacy, and allied health. Top Doctors is an annual survey of health care professionals conducted by PHOENIX magazine. This peer-selected list of the Valley’s best physicians s used by the public to make important decisions about their medical care. Congratulations! DMG is now offering the benefits of HIMSS membership to all of its staff through the HIMSS Organizational Affiliate program. A celebratory crowd filled the ballroom at Pointe Hilton Tapatio Cliffs Resort Thursday night to honor the finalists and winners of the 2018 Healthcare Leadership Awards. Sponsors of the event included Blue Cross Blue Shield of Arizona, the Arizona Medical Association and Merestone. • Outstanding Physician: Dr. Crista Johnson-Agbakwu (pictured left), founding director of the Refugee Women’s Health Clinic at District Medical Group and Maricopa Integrated Health System. Dr. Johnson-Abgakwu began the Refugee Women’s Health Clinic in 2008 to provide a culturally grounded, patient-centered medical home for the growing refugee community in Maricopa County. 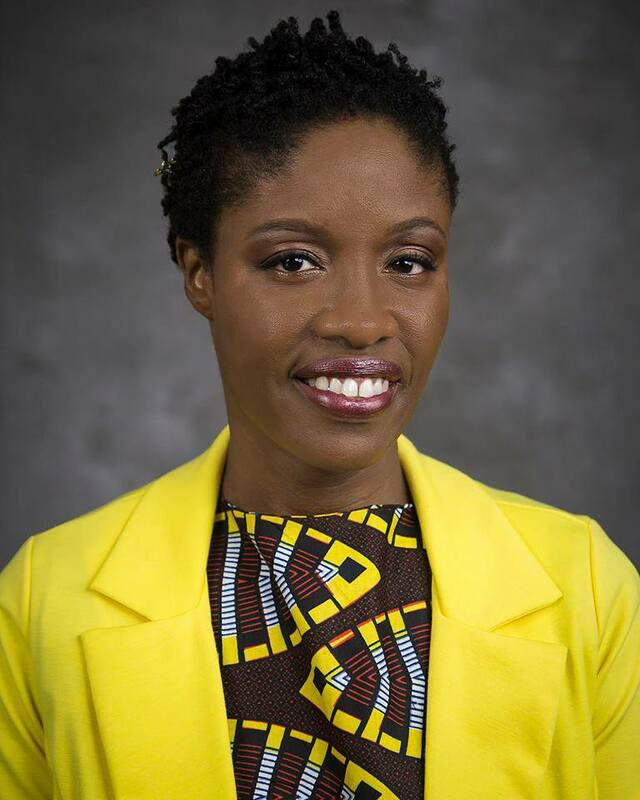 Dr. Johnson-Agbakwu has developed MIHS’s Refugee Women’s Health Clinic into the only one of its kind in the nation dedicated to reaching out to the refugee women and children. 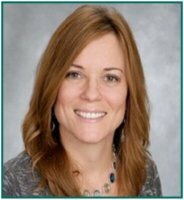 • Community Impact: Dr. Carie Barlow, Volunteer Physician at Mission of Mercy Arizona. Dr. Barlow felt a strong desire to try to help those who were less fortunate and did not have access to quality healthcare. 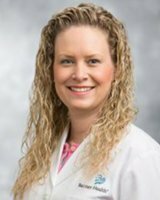 So since 2014, she has used her background in internal medicine background to help Mission of Mercy’s patient population, many of whom have gone years without any medical care. • Outstanding Healthcare Design: Orcutt | Winslow. As a homegrown firm, Orcutt | Winslow’s healthcare design studio has contributed to the planning, architecture and interior design of more than 30 major hospital campuses in Arizona, including the design of some firsts — the Surgical Transitional Intensive Care Unit at Banner Desert, the Healing Garden at Banner University Medical Center – Phoenix and Desert Pain Institute’s fully sustainable facility for pain management and outpatient care. • Outstanding Achievement in Behavioral Health Management or Treatment: Southwest Behavioral & Health Services. When Gov. Doug Ducey declared a health emergency over the number of people dying from opioid addiction, Southwest Behavioral & Health Services helped provide the framework for the governor’s executive order. SB&H is working tirelessly to stay abreast of the national trends to improve the outcomes for opioid addicts, to save lives and to help alleviate the opioid crisis through its four statewide opioid replacement clinics. • Outstanding Healthcare Facility: Cigna Medical Group Phoenix Central Multi-Specialty Center. Patients can see their doctor, get lab work, have an X-ray and pick up a prescription all at the Phoenix Central office. More than 6,500 patients call the Phoenix Central office their medical home, nearly 500 patients visit the center every day and 95 percent of them and extremely or very likely to recommend their doctor, according to a survey. • Outstanding Achievement in Healthcare Delivery: Advinow Medical. James Bates and the AdviNow team developed artificial intelligence that reads medical textbooks, research and existing medical records to create the world’s most automated medical visit. The provider time, including all documentation, per patient is reduced from 20 minutes to three minutes while improving patient satisfaction and outcomes. This unique technology could change the way patients and physicians interact from now to the future. 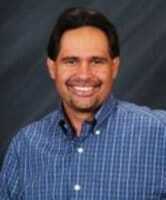 • Outstanding Healthcare Innovator or Researcher: Dr. Michael Kruer, Neurologist at Phoenix Children’s Hospital. Dr. Kruer is leading the way to finding a cure for children with cerebral palsy. He founded the Cerebral Palsy Genetic Research Network that connects physicians and researchers worldwide. Through his leadership, his team collects DNA and cell samples and performs whole exome or whole genome sequencing to identify the genetic basis of disease, hoping it unlocks a cure to this complex disorder. • Outstanding Healthcare Executive: Peggy Chase, president and CEO of Terros Health. Chase analyzed the way providers care for patients and the way patients receive care, discovering that physical and mental health conditions are often treated in silos. Chase changed that with specialists who treat the mind and body as one. This groundbreaking model of care is yielding better patient outcomes and the community is reaping the rewards of better treatment. • Lifetime Achievement Award: Jimmy Walker, founder of Celebrity Fight Night. Walker has helped raise more than $100 million for Arizona nonprofits. He helped build the Muhammad Ali Parkinson Center and Movement Disorder Clinic at Barrow Neurological Institute. And he enlisted Harrison Ford, Jim Carrey, Celine Dion, Tom Brady, Billy Crystal, Robin Williams, Jennifer Lopez, President Donald Trump and hundreds of other A-list celebrities to help him accomplish his philanthropic work. SCOOOT provides an early experience of independence for kids with mobility challenges. It frees them to explore their home, play, chase and race friends and siblings without any help. Expert clinicians, designers and engineers worked hard to create a device that will help kids discover new skills as well as new pals. The potential for physical and cognitive development was a key factor in every element of the design. Spina Bifida Association of Arizona Inc. (SBAAZ), an organization committed to enhancing the lives of those affected by spina bifida in Arizona, was awarded a grant from the PayPal Gives Corporate Advised Fund at Silicon Valley Community Foundation. The grant was recommended by PayPal’s employee-volunteer led Chandler, AZ GIVE Team. The SCOOOT program idea was presented to the SBAAZ by CRS’s Myelomeningocele Planning Clinic Lead Physician Pamela S. Murphy, MD, FAAP. The program was coordinated by Sharri Runnels, executive director of the SBAAZ, along with SBAAZ board member Linda Thunn, PT, DPT who is also the Myelomeningocele Planning Clinic physical therapist at CRS. The CRS Myelomeningocele Planning Clinic occurs every Friday, and they see approximately seven patients for all day clinic, visiting up to 13 different providers, having blood work drawn, and if necessary they will get casted for their orthotics and/or have x-rays. SBAAZ provides lunch and signs people up for their medical alert bracelets. Free Arts of AZ is there for the kids to create projects at lunch time. The SCOOOT program involves readiness assessments, equipment placement, activities and progress checks that will empower ‘toddlers’ to keep pace with their siblings and peers as they establish a sense of mastery over their world. The mobility device, resembling a toy more than a piece of medical equipment, allows children to reach items from the floor, ambulate, and enter/exit the seat safely at will. Spina bifida (Myelomeningocele) is a birth defect in which the spinal canal and the backbone don’t close before the baby is born. This type of birth defect is also called a neural tube defect. The SCOOOT Earliest Mobility Program kicked off was on Friday, November 10, 2017 with placements being made at the CRS Myelomeningocele Planning Clinic. 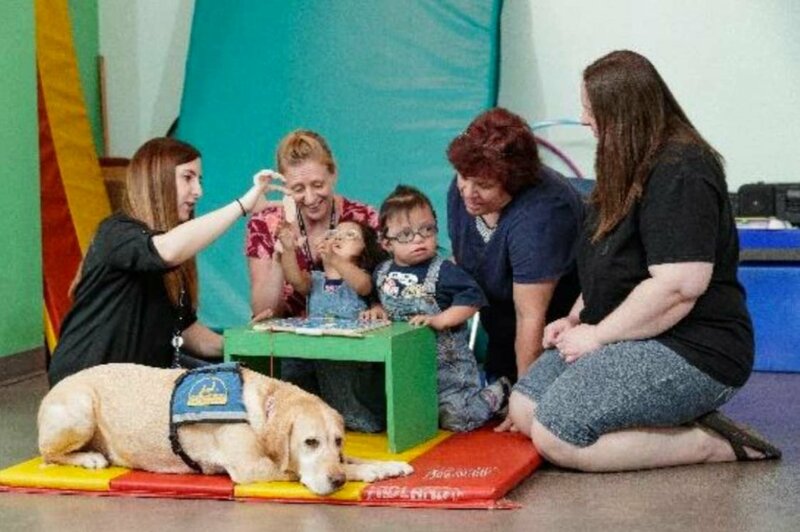 The Children’s Rehabilitative Services (CRS) Pediatric physical therapists provide support and services for children (birth to 21 years) with developmental disabilities, and their families. They aim to develop, restore and improve mobility to improve quality of life. Pediatric physical therapy benefits children and their families/caregivers by promoting activity and participation in everyday routines, increasing functional independence, improving strength and endurance, facilitating motor development and mobility, and easing the challenges of daily caregiving. Because patient’s are allowed to ”opt in” for services past the age of 21, there are several physical therapists qualified to treat individuals over the age of 21 as well.